Whether you see golf as an intense, white-knuckle competition, or a leisurely stroll around a course, the game has endured and the magic of the sport keeps growing. In this episode, we’ll take a look at how innovations have made golf bigger, better and more accessible than ever before. At its core … it’s a pretty simple game. You take a stick, and swing at a ball, and keep doing it until the ball reaches its target. That’s why golf has endured for over a half a millennium as a leisurely (and occasionally frustrating) way to bask in the glow of a nice day. But although the game remains fundamentally the same, technological advances have changed almost everything surrounding it. Golf’s quirky path to popularity. A “rut iron” to dig your ball out of irregularities in the landscape was just one of many odd, archaic technologies on our way to today’s current streamlined tee-to-green experience. Old balls weren’t balls at all, and the trademark inward dimples of today’s ball were discovered by accident. And with the founding of Ping – a putter that in its early days was also unintentionally a tuning fork – putters finally helped you guide the ball to where you wanted it to go. Those were just some of the myriad advances that helped move the game along and make it accessible to everyone. An analog game in the age of analytics. AimPoint provides real-time green-reading data, and old Doppler technology tracks wayward drives. 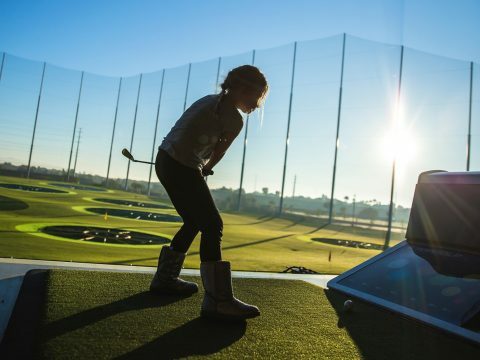 And now, with Topgolf, there’s a target-oriented, data-driven entertainment experience that makes golf accessible to people who ordinarily wouldn’t consider the sport. By providing live music, sports on TV, food and drink, they’ve created an experience centered around chips in balls that do more than just aid in target practice, they provide a feedback loop that maintains your interest and rewards you – in a sense, not all that much different than the game itself, just a super-charged version of it, aided and abetted by great technology innovations. What happens when you mix Doppler radar with golf swings? Loren Rubinstein Loren Rubinstein was a longtime golf correspondent for the Globe and Mail, has written fourteen books about golf books and is a member of the Canadian Golf Hall of Fame. 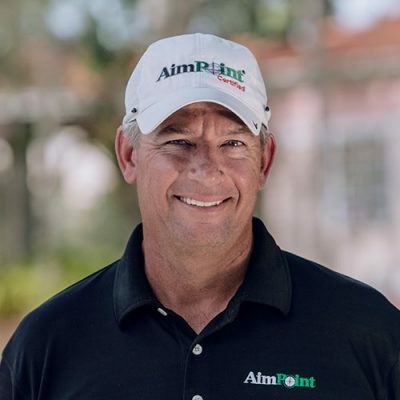 Mark Sweeney Is the founder of AimPoint Golf and the inventor of AimPoint Virtual Putting Line for which he won the George Wensel Technical Achievement Award. 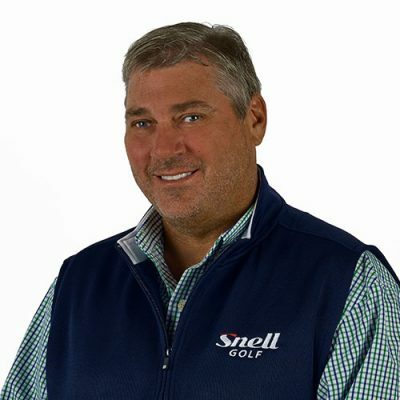 Dean Snell Otherwise known as the golf ball guru, Dean Snell is the founder of Snell Golf, and has spent over 25 years designing golf balls for some of the most famous players in the game. 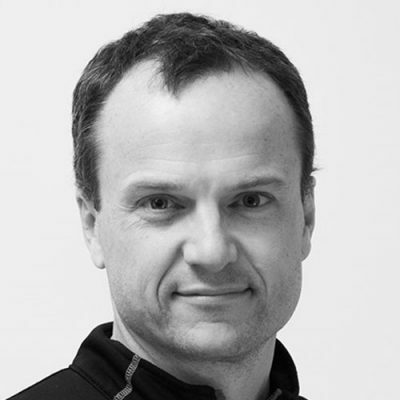 Fredrik Tuxen Is a radar scientist and the co-founder and Chief Information Officer for TrackMan. John Solheim Is the CEO of Ping Golf and the grandson of Karsten Solheim, the company’s original founder. 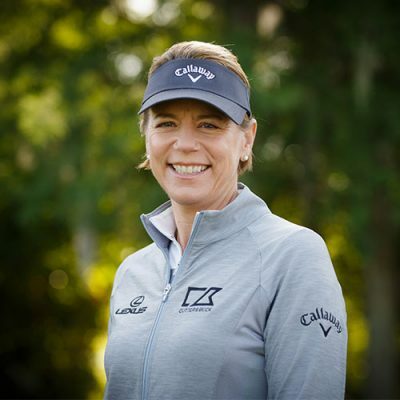 Annika Sörenstam Is a retired Swedish professional golfer who is regarded as one of the best female golfers in history and a member of the Golf Hall of Fame. Eric Anderson Is the Co-Chairman and CEO of Topgolf Entertainment Group. Anderson was recently ranked by Golf Inc. as the No. 8 most powerful person in golf. Jerry Yang Is the co-founder of Yahoo.com and was the keynote speaker at the USGA's North American Golf Innovation Symposium, where he discussed the limitless ways technology can impact golf. WALTER ISAACSON: It’s the middle of a Danish winter, and Fredrik Tuxen is looking out over a garden covered in snow. 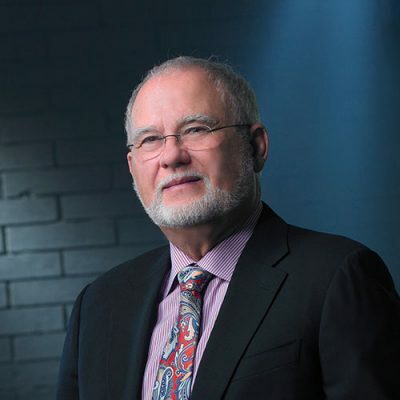 In a previous career, Tuxen had been the head of R&D for a military company specializing in radars capable of tracking bullets and missiles, systems at the cutting edge of technology that cost millions of dollars a piece. And now a short while after leaving that job, Tuxen finds himself here in this snowy garden trying to use that same military grade technology to search for a golf ball. It’s a journey that began when he was approached by the owners of four of the biggest driving ranges in Europe. Players at their facilities didn’t have the luxury of going to find the ball they’d just shot before taking their next swing. They knew of Tuxen’s work and wondered, if this technology could track a bullet, could it track a golf ball as well? Tuxen had a feeling he knew the answer and quickly quit his job and started developing a prototype of what this technology could look like. He worked out of a garage belonging to one of his business partners. And once they had a mock up of the technology, they dragged it out onto the snowy garden to test it out. Tuxen plunked a golf ball down on the ground and took a swing. The ball made a cracking sound as it made impact with the club traveling all the way to a marker on the other side of the garden and eventually falling deep into the snow. Tuxen turned to his engineer who had his hands at the controls of their prototype. Did you get that, he asked them. 62.7 yards, the engineer replied, 3.2 yards left of the target. Tuxen walked to the exact spot and looked down. And there in the snow was a little black dot marking the spot where the ball had broken through the snow and fallen to the ground. He smiled, knowing that he may have just changed the game of golf forever. I’m Walter Isaacson, and this is Trailblazers, an original podcast from Dell Technologies. SPORTS ANNOUNCER 1: More than ever before people are playing golf. SPORTS ANNOUNCER 2: And the crowd likes it. SPORTS ANNOUNCER 3: This golf club is designed for maximum speed and distance. SPORTS ANNOUNCER 4: People just like to get outdoors where they can relax and have fun. SPORTS ANNOUNCER 5: Out of bounds. SPORTS ANNOUNCER 6: He’s got to make a 330-foot putt to take the green jacket. WALTER ISAACSON: We’re in a pasture somewhere in Scotland 500 years ago, though it could be in the quiet countryside anywhere. An unremembered person is ambling across a quite field loosely holding a stick. Spying a pebble, the wanderer impulsively swings his stick down to meet it sending the stone airborne in a very pleasing arc. He or she never imagined that this one simple act would later become a seminal moment in the history of sport. WALTER ISAACSON: Lorne Rubenstein has spent decades writing about golf, and he was recently awarded the PGA of America Lifetime Achievement Award in journalism. LORNE RUBENSTEIN: I think there’s a human instinct to just– they see a pebble on the ground to kick it towards the target, and the same thing if you find– you pick a twig off a tree. Some golfers started the game that way, players like Sam Snead for example just out in the woods in Virginia and just grabbing a tree and a twig and hitting a golf ball towards a target. WALTER ISAACSON: Ever since, that irresistible impulse to hit a pebble with a stick hasn’t lost its luster. Last year more than 26 million Americans played golf at any of the 15,000 golf courses. As you’re about to hear, the game of golf remains simple and unchanged. But the golf industry is experiencing a renaissance, a multibillion digital high stakes race back to its original pastoral roots. To meet that ageless goal of getting the ball in the hole, today’s golfers might use position crafted parameter weighted clubs, five layer urethane covered golf balls aided by dozens of apps and IoT sensors. LORNE RUBENSTEIN: So one of the early golf clubs, for example, was called a rut iron. It had a very small head, and it was designed to help a player just pick the ball out of the rut that he or she would find the ball in and to get it out of there. So the early clubs, the early drivers were called play clubs because it would say on the tee, play away. And they had kind of long– they were called long-nose clubs. They were thin, but they were actually long. And they were kind of curved almost like a bow of a bow and arrow in the early days. And gradually, club making became more important, and people started figuring out, well, I need a club to hit the ball to curve it this way or I need a club to hit the ball more in the air. WALTER ISAACSON: Society folk took a shine to the game. For everyone else, it became cost prohibitive. A key reason would be the cost of golf balls. Popular legend suggests that the very first golfballs were likely made of beech wood, handcrafted by carpenters. Technically speaking, they were lousy. With their smooth surface acting against the air, they rarely traveled more than 100 yards. 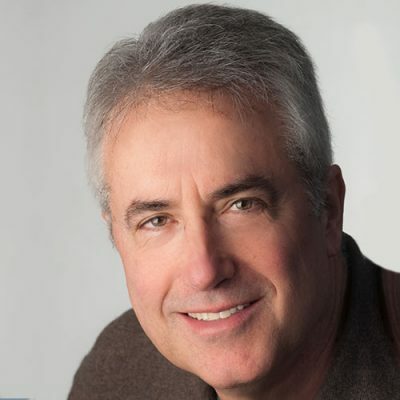 LORNE RUBENSTEIN: Well, the early golf balls were called featheries, and they were just kind of a hat full of feathers kind of pushed in through a little needle like hole into a leather sphere. And somebody who made golfballs could only make four or five of those in a day. It was very, very labor intensive, and it was easy to ruin them as well. I mean, they didn’t last very long, and they were expensive. So in the early days, you wouldn’t say that there were a lot of people playing golf because it was expensive. WALTER ISAACSON: As golf balls and equipment became more sophisticated and more expensive, the game became a sport for the upper classes. The feathery golf ball remain the go to design. That is, until about 1848, when according to legend, a Scottish divinity student received a package in the mail that would disrupt two centuries of golf tradition. The student was Robert Adams of St. Andrews University, and the package was from Singapore. It contained a statue of the god Vishnu. But for Adams, the intriguing part was the packing around the statue, a dried gum resin called gutta percha from certain species of Malaysian trees. Adams knew that gutta-percha could be heated and molded, and he used the material in the package to create a new golf ball. And so began the era of the gutta-percha golfball or guttie. It was a borrowing of technology originally intended for another purpose. And like many other disruptions in the game over the years, it would impact the sport down to its very core. DEAN SNELL: Where everyone thought, geez, this rubber golf ball has more bounce than the feathery weather pouch does. So it goes further. WALTER ISAACSON: Dean Snell is CEO and president of Snell Golf. DEAN SNELL: Well, as the players started playing with this gutta percha golf ball, they started to scuff it up. And as they scuffed it up, they started seeing it go further. So the thought process was, let’s put little slices in it and it’ll add distance. After that project came, it was more of, boy, if we put something to break up the floor around the ball– which is what the damage was actually doing. But if we put it on there purposely, they’ll go further. So golf balls actually started with something called brambles, which are inverted dimples. So the first couple of golf balls had dimples that came out of the ball instead of into the ball. So that went on for quite a while. And then someone said, I think we can break the air flow more if we put the dimples inside the ball. So that’s kind of how the aerodynamics started. WALTER ISAACSON: What golfers learned then, and physicists know now, is that a smooth round ball traveling through the air causes a low pressure tail behind it, creating drag. Adding dimples to the surface disrupts the air flowing around the ball, shrinking that low pressure tail and reducing drag. In golf speaks, that boiled down to two words– more yardage. In Europe and America, golf grew rapidly and was now among the sports played in the Olympic games of 1900. Fast forward to 1967– golf technology has seen some dramatic changes by this point. But to a Norwegian born engineer, Karsten Solheim, they weren’t nearly dramatic enough. His son, John Solheim, explains. JOHN SOLHEIM: He had been invited by the engineers that he worked with, at GE to play golf, them not knowing that he had never played before. As he played, he realized, when he putted the ball, he couldn’t understand how to get it to go where he wanted. He thought he was pretty smart about it and tried hitting the ball, and it just would not do what he wanted. And then he realized that the waiting in the putter had all the weight behind the ball and not to the extremes. When he was at Ryan Aircraft, he went off when some of the airplanes that they had. And he realized that, if the wingtip tanks were full, the plane was a lot stabler than if the tanks were empty. And so he started putting that to the putter and putted the weights to the extreme. And it made a real difference for it. WALTER ISAACSON: It hadn’t occurred to Karsten Solheim to share his engineering insights with the rest of the golf world until a chance meeting some time later. JOHN SOLHEIM: He was on the putting green practicing. He was putting, and the golf pro came over to him and commented what a good putter he was. And his comment was that you should have seen how bad I was before I built my own putter. Then he explained the putter to him. And the golf pro said to him, well, if you can make a putter that rolls the ball as well, you’ll sell a million. Little did he know that he way underestimated. REPORTER: A tragedy occurred during a simulated countdown for the first flight of the Apollo program. WALTER ISAACSON: Fire took the lives of the astronauts of Apollo One. With the program on hold, the move to Florida was canceled. It was about then that Carson Solheim made up his mind. He would quit his day job to devote himself to engineering golf clubs under the now iconic brand name Ping. John Solheim, now chair and CEO of the company, tells the story of its name. JOHN SOLHEIM: The story behind the name Ping is kind of funny because he built a putter, his first putter, it was two parallel blades with weights on the heel and toe and then a torsion bar on the back on the sole that the shaft connected to. What he didn’t realize when he designed this putter to get it to roll the ball was the fact that he had built a tuning fork at the same time. And as soon as he hit the first ball with it, he knew the name. And that’s where the Ping name came from. And it rolls off your tongue awfully well. WALTER ISAACSON: Golf club engineering had reached a whole new level. By the early 1990s, budget cuts to the US department of defense displace hundreds of aerospace engineers. With the common push for better aerodynamics new materials and innovative design, the golf industry was a natural fit. And as the engineering of golf clubs has evolved, so have golfers. Dean Snell of Snell golf. DEAN SNELL: What was required back in 1995 is a lot different than what is required in 2005 where the players now are stronger, the drivers are longer, and the game changed quite a bit. So having to solve other problems with these players hitting the ball so far was kind of a cool project we had where a lot of them were having trouble keeping some of the 4 and 5 irons in the air. Some of them couldn’t make them spin enough when they were switching to the new hybrid clubs that were coming out. The drivers spin rates were getting even lower. So they were having problems controlling the distances. WALTER ISAACSON: Dean Snell is a new kind of spin doctor in the highly competitive category of golf ball design. DEAN SNELL: So you can create the best ball in the world, but if you put the wrong dimples– which I’m talking depths and how many circles and the size of the diameter and the edge angles and the paint layers– if you get that wrong, your best design is going to wait. WALTER ISAACSON: Each month, by Snell’s estimate, there are 60 to 90 applications for golf patents. He holds more than three dozen. DEAN SNELL: It’s funny because, when you tell people you work in golf balls, they say it’s white, round, and rolls on the ground. So what’s so crazy about it? But it’s a very, very complicated project. FREDRIK TUXEN: I had completed a radar system for the U.S. Army and late at night, I had my golf clubs in the back of my car. I was all by myself. And I thought, if I can track a bullet, why can’t it track a golf ball also. So I actually made it capable of doing that. But then I forgot all about it because this was a $2 million radar system. And connecting that with golf was sort of a no go. WALTER ISAACSON: Tuxen wouldn’t act on this idea until 2003 when a group approached him with a proposition. Would he be willing to quit his job and help develop a golf analytics system based on his previous experience in Doppler radar technology? FREDRIK TUXEN: That question actually took me 48 hours to answer. But during those 48 hours, I didn’t sleep. I actually designed the whole system so see if I thought this could actually be feasible to get to a cost that would make sense to connect this to golf. WALTER ISAACSON: This was the origin story behind TrackMan, a golf analytics system used today by 80 of the world’s top 100 golfers. The system gathers data so intricate that certified instructors are needed to interpret it for the clients. And the data challenged conventional wisdom. Not surprisingly, there was pushback. But as TrackMan started dispelling long held beliefs about golf mechanics, its credibility grew. FREDRIK TUXEN: I mean, at the time when I was taught golf, I was always told that the direction the golf ball starts is the direction you swing your golf club. That’s called the club path. And what we found out with TrackMan, the initial direction of the ball is not so much how the direction you are swinging the club, it’s how you are aiming the golf club at impact, your so-called face angle, the orientation of the club. WALTER ISAACSON: As Fredrik Tuxen learned firsthand, the golf community can be glacially slow to embrace its trailblazers. At about the same time Tuxen was launching TrackMan, another chapter in golf tech was taking form. MARK SWEENEY: I was watching the British Open in 2003, and I watched a number of players all miss the same putt the same way. WALTER ISAACSON: Mark Sweeney was an amateur golfer who struggled to read putting greens. MARK SWEENEY: It was only about a 15 foot putt, but they kept missing it over and over again. And one of the announcers said, green reading’s a God given talent. You either have it or you don’t, and that really bothered me. WALTER ISAACSON: It bothered him enough to invent a scanning software system for reading golf greens and correctly predicting the path of a putt. Mark Sweeney couldn’t wait to unleash it on the golf world. But the golf world could wait. 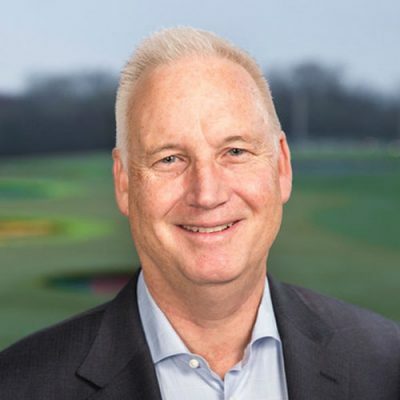 MARK SWEENEY: The best advice I ever got and when I first started Aimpoint in 2003, a guy at the PGA Tour said, if you really believe in what you’re doing, you’re going to have to be patient because golf is very slow to adopt. And so, I was thinking, so this might take a year. And it ended up taking four years. And even after four years, I was still getting pushback. And he was explaining to me how video analysis took 20 years to take off. WALTER ISAACSON: Then when Sweeney was about a week away from giving up, the Golf Channel called and agreed to use Aimpoint on the air. The promise was, by that using Aimpoint, TV viewers would be able to see the projected arc of any given putt. Mark Sweeney and the world of golf never looked back. But Aimpoint couldn’t have succeeded without using technology to shatter some of golf’s more tightly held misconceptions. MARK SWEENEY: The interesting thing at the time was that there wasn’t any limitations on technology to get it done. There was a mindset in the industry that it couldn’t be done, that they actually thought that putting defied the laws of physics in a lot of cases. And there was mysterious effects that mountains and lakes and rivers have on the golf balls, which is actually not true. WALTER ISAACSON: The history of technology in golf is very much a story of unlikely trailblazers, people who would disrupt the game in their own quiet ways. Not unlike Annika Sorenstam, who over a decade beginning in the mid 90s, earned herself a place among the best golfers in history. ANNIKA SORENSTAM: Growing up, I was hesitant to raise my hand in class to answer a question in case I was wrong and all the other kids would laugh. And you know when you win a golf tournament, even at a club level, you have to give a winning speech. And that would terrify me. And so, I figured it’s better to finish second or third. Now you still get a prize, but you don’t have to say anything. So yes, I would lose on purpose. WALTER ISAACSON: History would see Annika Sorenstam’s intentional losing streak eventually come to an end, watching her win 90 international tournaments as a professional, more wins than any other female golfer in history. She doesn’t mind technology changing the game, providing it doesn’t change the golfer. ANNIKA SORENSTAM: You still have to hit a shot, and not every shot is from a perfect lie. Not every shot is a straight shot. Sometimes you have to work the ball around a tree, under a tree or something. And that’s when feel comes in. It’s really important to have the feel. So I would say the best players have a good combination of feel, and they have good technique. They do use technology, but it doesn’t get overconsumed about numbers and you forget just how to play golf. You become a robot if you look at too much of that stuff. WALTER ISAACSON: Sorenstam believes the real benefit of technology is not playing the game for the golfer, but making the game more fun and helping attract new players. ANNIKA SORENSTAM: I do enjoy the technology just to be able to get better as far as learning how you know to hit the ball further, hit the ball higher, just learning about clubhead speed, ball speed, launch angle. But also Aimpoint, when it comes to reading putts, everybody knows it’s not just how far you hit it. It’s also about making putts, and learning how to read greens is certainly important. So you know I’m a big believer that technology will make the game a little easier than it is. But of course, the main skills are still to get the ball in the hole. So like I said, I welcome anything that will makes someone want to get involved in the game of golf. LORNE RUBENSTEIN: Right now there is so much information available that golfers can confuse themselves so easily. 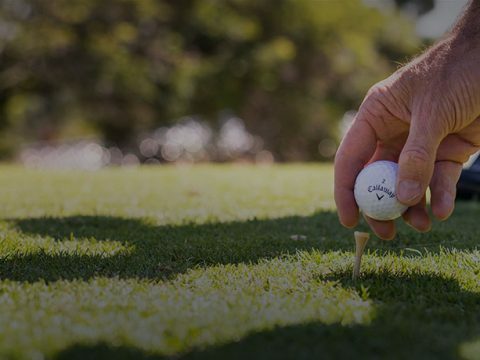 WALTER ISAACSON: Lorne Rubenstein believes that technology such as Aimpoint and TrackMan may improve the game provided they leave room to enjoy the simple pleasure of hitting a ball with a stick. LORNE RUBENSTEIN: Somewhere along all of this there’s got to be some kind of combination of feel and intuition with technique and technology that marries those elements together, and that’s I think what everybody is working towards right now. WALTER ISAACSON: Technology is doing more than disrupting golf equipment and gameplay. It’s unlocking new ways to attract a whole new generation to the game. This is Topgolf, where the experience of a driving range converges with food, drink, music, and technology to create a digital entertainment experience. Topgolf originated in England nearly two decades ago. Two brothers were comparing shots on a driving range and wondered why a chip couldn’t be placed in a ball to read how far and where it went. Originally, it was created as a means of Target Oriented Practice, the phrase that forms the acronym TOP. Whereas TrackMan and Aimpoint focus on clinical aspects of the game, Topgolf is designed for the fun factor. Erik Anderson is executive chairman. ERIK ANDERSON: We are creating this world, this sports entertainment community. But it attracts everybody. And I think that’s the coolest thing. If you come to Topgolf now, you’ll see people who hardly know how to play golf, and they’re just happy it goes into– even if it dribbles into a target, they’re so excited. It’s like bowling with bumpers, remember, to the place where this year for the Hawaii Open, Marc Leishman was quoted as saying, well, I got ready for my tour experience this year by practicing at Topgolf. WALTER ISAACSON: It works like this. At the front door, you’re given a swipe card. Inside is part restaurant bar with open driving range bays around the side. Swipe your card at a bay, hit a few balls, your friend hits a few, and the screen shows exactly how you did, and more importantly, who did better. You can take a break and watch a big screen TV, but perhaps there’s live music. When you’re ready, swipe your card and golf some more. As with any consumer based start up, the first task was to identify and overcome barriers. ERIK ANDERSON: First of all, the things you would think about that make golf challenging for people– it can take a lot of time. It can be very expensive. It can be scary. You’ve got weather. It’s very linear, and there’s a lot of rules. And it can be pretty intimidating. That was golf. When you look at Topgolf, we sort of try to knock every one of those things down. So you can come into a place. It’s warm. It’s inviting. There’s music. There’s no real rules. You can hit the ball not as poorly or as well as you can. You can share Instagram. It’s a very parallel experience. WALTER ISAACSON: Part of the Topgolf strategy is to take the game away from the sometimes intimidating context of a golf course and deliver it to a new generation of customers on their own terms. ERIK ANDERSON: So, again, you can stop– like I say, it’s very important you can play the game, stop, Instagram, involves social media, have fun, and re-enter your game, watch your sports while you’re doing it or whatever else you want to put on the TV. WALTER ISAACSON: And it turns out the connection to Topgolf is good for golf. Rather than displace or digitized the game, Topgolf believes it’s reinvigorating traditional golf. A recent survey by the National Golf Foundation showed that 29% of golfers say Topgolf leads them to play the more traditional game. But according to someone who has a pretty decent track record with predicting the future, what’s in store for the game may look anything but traditional. Back in 1994, Jerry Yang was a co-founder, and later the CEO, of Yahoo. Today he heads his own technology startup investment firm. And among his portfolio are investments in technology companies specializing in golf. JERRY YANG: Golf as a sport has evolved over 400 years, and technology has always been front and center of all the debates about the game itself. WALTER ISAACSON: Like many of the trailblazers who have disrupted the game before him, Jerry Yang looks to the world outside the game for inspiration. 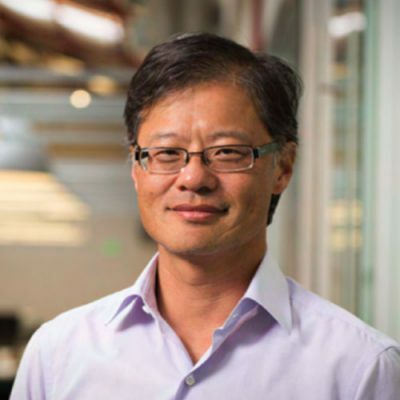 JERRY YANG: You know one of the things I talked about as a hypothetical– and it got a lot of responses– people are using robotics and haptic suits and things like that to help the disabled today, to help people walk better, to help people recuperate from injuries. But you can imagine if is used in sports like golf where you can enhance a player’s ability to hit the ball farther. WALTER ISAACSON: A haptic suit would be able to provide physical feedback to the wearer. Want to swing a golf club like Tiger Woods? The suit would compare what your body is doing when you swing to what Tiger Woods does and then provide feedback to get you closer to your goal. JERRY YANG: As you’re making that swing, your suit will tell you that you’re too inside, you’re turning too little, or you’re opening up too quick. And so, that instant feedback around haptics is clearly possible in that training setting. But I would say, if some day that people are allowed to wear that suit on a golf course, you might be able to hit the ball further because a haptic suit could help you swing faster, it could help you accelerate more. There’s all kinds of possibilities because these are, again, applications that are being done today for non-golf applications. So it certainly is conceivable it could be used in a golf context. WALTER ISAACSON: It’s another potential case of technology changing what on the surface is a very straightforward and simple game. JERRY YANG: Yeah, I think the spirit of the game is always about seeing a golf ball go into the hole. That’s really why the golf is such an addictive sport. That’s why people enjoy it. There is nothing like hitting a great shot that you envisioned whether you’re 18 handicapper or a professional golfer. So I think that’s the magic that happens in golf. But I do think that the introduction of data and, more importantly, real time data that allows people to understand, on the whole has brought more benefit because the way golf used to be taught is very much by feel and by an instructor looking at you. But today there is a lot more objective ways of looking at how you are swinging, how you’re impacting, how you’re hitting the ball. WALTER ISAACSON: Golf has existed for at least 500 years and may well exist for 500 more. There are 60 million golfers in the world today who spend their free time strolling through pristine landscapes of trees and grass aided by some of the most technically sophisticated equipment known to science. For all the analytics and data gathering, the dimple profiling, and aerospace alloys, the secret to golf staying power is no secret. As people like Annika Sorenstam and Jerry Yang will tell you, it’s about the simple joy of hitting a little white ball into a hole. I’m Walter Isaacson, and this is “Trailblazers,” an original podcast from Dell Technologies. On the next episode, we’ll be looking at the history of privacy, a hot button topic of today with a surprising history that goes back a bit farther than you’d think. And if you’d like to find out more about anything we’ve talked about on today’s show, please visit our website at delltechnologies.com/trailblazers. Thanks for listening. Digital transformation in full swing. The Internet of Things is shaking up industries from agriculture to healthcare. Golf is no exception. From connected golf clubs to golf balls embedded with RFID chips, IoT is giving golf a tech makeover.